Announcing the Fairdale Community Fund. 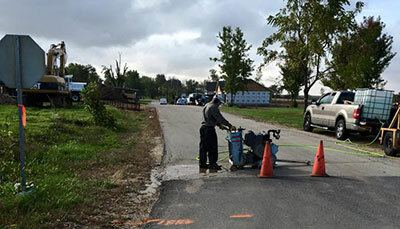 A newly established designated fund at the DeKalb County Community Foundation, created to provide ongoing support for maintenance costs of the Fairdale community septic system completed in December 2015. Under the careful direction and guidance of the DeKalb County Long Term Recovery Corporation (DCLTRC), rebuilding efforts and infrastructure placement are nearing completion. Of the $1.4 million raised in private donations for support, $441,000 was used to construct the community septic system, replacing the damage and outdated septic field that was built before there was modern zoning. To remove the financial burden of a small community maintaining this large investment, the Fairdale Community Fund will provide the necessary funding to keep the system operational and maintained. To make a gift to the Fairdale Community Fund or to discuss charitable interests of your own, please contact Executive Director Dan Templin, 815-748-5383 or dan@dekalbccf.org. Pictured: Construction crews cut through existing roads in preparation of the community septic system. The system was completed in December 2015 and is fully operational for both new and current residents.